Phoenix Wright: Justice for All is the middle part of a trilogy of games that were ported from the Game Boy Advance for the Nintendo DS. 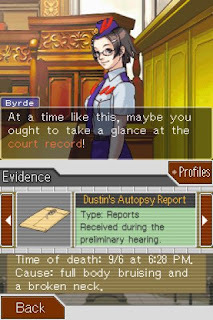 In all three games, you play defence attorney Phoenix Wright and have to get a 'not guilty' verdict for your clients by doing research, gathering evidence, picking apart testimony in court by cross-examination and by presenting evidence at the appropriate moments. An overarching story serves to string the separate cases together, concerning your colleagues, rivals and friends. The presentation is fairly simple but effective: in front of backdrops of certain locations like Wright's office, the courtroom or the scene of a crime, characters pop up - drawn in manga-style - who you can chat with. They are fairly limited in their animation, having only a couple of signature expressions each and some standard 'moves' that sometimes make little sense when people start appearing at several locations. For instance, a dignified lady sips a cup of tea, which seems right when we see her at home, but gets silly when she is later seen sipping the same cup of tea on the witness stand. The design is deeply charming however and though the cases might be grim - all of them are murders - the game revels in coming up with outlandish people and funny scenarios. One case involves circus people, another one spirit channelers and yet another costumed television Ninjas. The smart balance of seriousness and oddness is what makes the game so addictive. And though the solution to most of the cases is very unlikely, it does make sense within the context of the game. At first I was a little put off by how little influence you seem to have on the story. Though there is ultimately a 'good' ending and a 'bad' ending, this is the result of one single decision to be made during the final case. And even here you can just skip back in the story to find the 'good' ending. With the help from an occasional hint from an online walkthrough, there is no way you will not be able to finish this game. So you are pretty much just following along with the story, trying to find the right logical action to advance it. Sometimes you will have to go with a hunch, but often a bit of reasoning will keep you from getting stuck. By shouting 'Hold it!' or 'Objection!' into the DS microphone you can press witnesses on their statements - or you can just push a button instead, so you won't have to embarrass yourself on public transport. You will likely end up always pressing witnesses on everything they say. At best it will further your case and at worst it will give you some amusing dialogue in which you get made fun of. I felt a little thrown out of the games at times, as Wright - who is supposed to be you - can suddenly go off on an unexpected tangent when you present evidence, which you picked for a different reason. Vice versa, you can be on - what turns out to be - the right track but have trouble finding the right combination of testimony and evidence to get your point across. Being penalised because the game doesn't understand you, gets frustrating at points. Another nitpick is that during the investigations, characters have repeated standard replies when questioned about irrelevant people or evidence. These take too long to zap through every time you hit on them. Some of the music - which is tied to specific characters or locations - also gets a little repetitive. The stories and cast are very engaging and there is a lot of fun to be had in slowly uncovering the bizarre truth behind a case, as it twists and turns. Though each of the four cases in this volume will take you one or two long afternoons to get through, you will have trouble putting it down. After I finished, it felt like I just read a good book and I was left hungry for more. 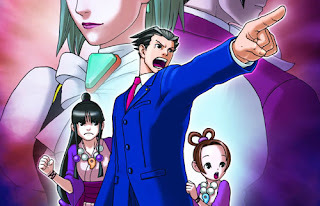 Just a tip though: as the story arcs throughout the three games, I would advise playing them in sequence: Ace Attorney, Justice for All and then Trials and Tribulations. The last one seems to be the best one - going by reviews - so the story ends on a high note. 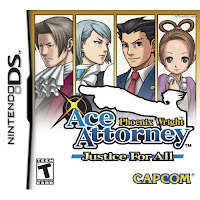 A new entry in this genre, especially developed for the DS, has also just come out: Apollo Justice: Ace Attorney. It makes more use of the touch screen and promises to be as good as its predecessors. Look online for the Flash interactive trailer! Court adjourned.